This beautiful piece of chopper craftmanship was sent to us by Ted from XS650 Chopper. It was built by Denis (AKA Billy Joe Fong) from Fong Bros who has built many sweet rides in the past. 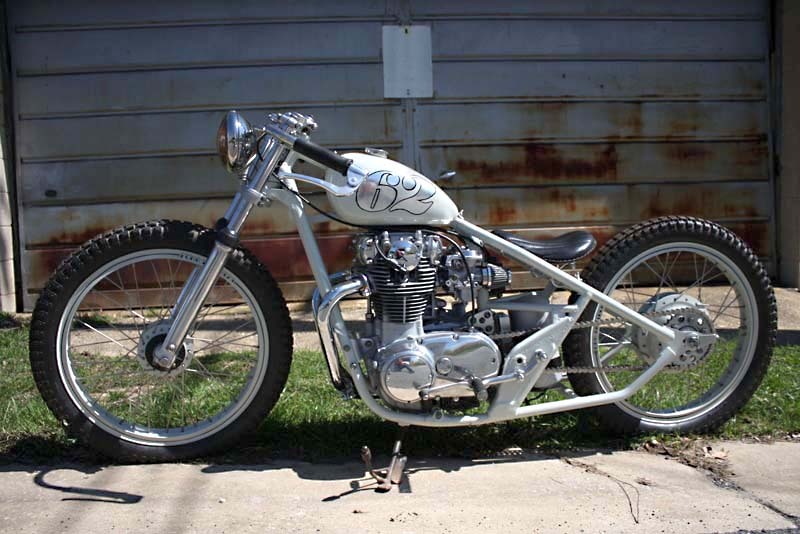 Here’s how Denis described the project: “As for the white bike, It’s a 1982 xs650 special. It was a mail delivery bike for the Post Office in either Delaware or Pennsylvania but was only used for about 10,000 miles. The tail is a TC Bros tail that I made some very minor mods to. I was using Kansas Kustoms but I was able to get a good deal with TC Bros. From front to back, here’s what was done. The forks were done by hand. I used an angle grinder and a hand file to get rid of all the tabs and smooth them out, then polished them. They are also lowered 2.75 inches. The front and rear wheels are 21 inch Ankront’s laced to the 650 hubs and have Trials tires. I usually don’t like to use shouldered wheels, but I wanted Fong Bros on the wheels and it was easy to do on the shoulder. I made the handlebars out of the stock bars and a pair of clip-ons. The gas tank is a high tunnel Wassel that did not fit well at all. I had to move the coil and cut part of the motormount off the top of the engine to get it to fit. It is silver leafed. There is a LaRosa polished seat. I pretty much just wanted it to look old.” Denis has truly created a super clean vintage looking bike, right down to those ingenious boardtracker styled handlebars. To see more pics of this old school chopper check out XS650 Chopper.